Sudanese Affliction That Reveals the Pain of the State of Sudan! The Sudanese Affliction reveals itself in the pain and sufferance of the state of Sudan, which the state lives every day, since the independence from England in 1956. Was the independence a failure? How national Sudanese governments failed Sudan? Why national Sudanese governments have failed Sudan? Whom else would you hold responsible for the failure and the pain and sufferance of Sudan? Boy, you will just be inspired by the political inspiration you will get from the Sudanese sequence of articles here on the HOA Political Scene Blog. hoa-politicalscene.com/sudanese-affliction.html: Sudanese Affliction: بلاء سياسي سوداني. Khalid Mohammed Osman's political sayings in English 1. أقوال سياسية لخالد محمد عثمان بالانجليزية. Before reading about the affliction of the Sudanese political scene, it's good to go through the introduction to know where did this article start and where did it end. The article is very long so it is divided in many episodes in a sequence of Sudanese political articles. It started with other titles from episode 1 and stretched into more than 200 episodes in the mentioned sequence. The Sudanese Affliction is epsiode 14 in the series. Below is the HOA Political Scene index of some of these episodes. The Arabic version of the Sudanese Affliction is at the Sudanese Political Affliction. Intro to Sequence 1, Episode 14: Sudanese Affliction! hoa-politicalscene.com/sudanese-affliction.html: Sudanese Affliction: إبتلاء سياسي سوداني. Khalid Mohammed Osman's political sayings in English 2. أقوال سياسية لخالد محمد عثمان بالانجليزية. The term "affliction" is definitely expressing itself in all levels of life in Sudan, throughout the policies practiced and carried out by both civil dictatorship and military dictatorship. In the political definition of any political dictionary, or political encyclopedia, it is familiar to say military dictatorship. That's well understood by anyone. Once that's correct, it is absolutely unfamiliar to say civil dictatorship. That might be annoying, awkward, clumsy, embarrassing, uneasy, or unpleasant. In reality, civilians in power can become dictators, when they rule for more than two decades, or for more than two election periods. Don't forget about forged elections. In the Sudanese case, the term "civil dictatorship" become familiar, because of the misbehaviors of the political parties that have ruled Sudan, since the independence and failed continuously to address the political problems of Sudan through decades of misleading the state of Sudan. This is why I say the term "affliction" has already exposed itself in all levels of life in Sudan, through the policies of the civil dictators and the policies of the military dictators. We are speaking about the term "affliction" revealing itself because of such policies. Therefore, it is a reveal of politics. Bad political practices reveal ailment, complaint, disease, disorder, evil, illness, indisposition, malady, menace, plague, scourge, trouble and visitation (as a disaster, or difficulty). 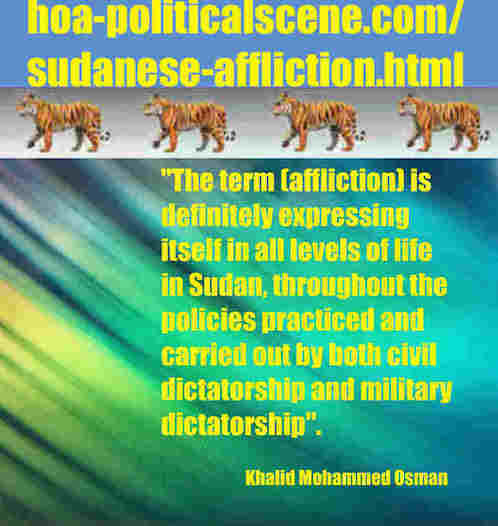 So, all of the synonyms of the term "affliction" are present in through all of the political problems in Sudan. This is why the use of this term with "Sudanese" and "politics" is so solid, in all of its terminologies. As such, we have a solid Sudanese Political Affliction to look at through deep political analyses. The Sudanese Political Affliction is the Arabic version of the Sudanese Affliction. 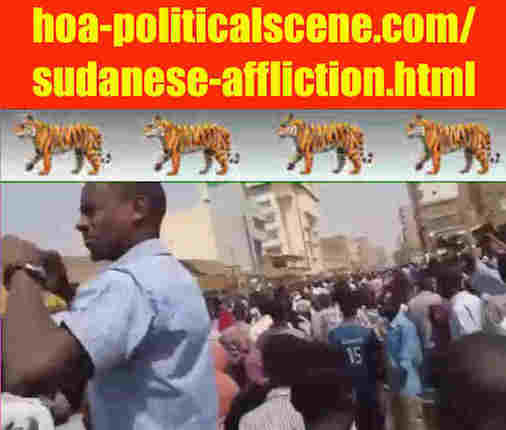 hoa-politicalscene.com/sudanese-affliction.html: Sudanese Affliction: فتنة سياسية سودانية. Khalid Mohammed Osman's political sayings in Arabic language. أقوال سياسية لخالد محمد عثمان باللغة العربية. The Sudanese policy pursued by the Sudanese political parties, especially the Sudanese sectarian parties, has been centered on narrow-minded party gains, through which these parties can retain power and cash in wealth and expand their party bases. Thus, Sudan's other problems, whether they are cultural, economical, health-welfare, political, social, or regional at all levels, were not given sufficient and serious attention from the so-called national parties, which have assumed political power in Sudan after the departure of the British from the country in 1956. The Sudanese parties, which took power in this way, continued to build their membership popular bases and exploit Sudan's national wealth in their budgets to maintain their presence in the political power and distribute the wealth to families and relatives and loyal members who run the election campaigns in favor of them and to buy votes. In such a Sudanese political reality, which hit Sudan with scourge, strife and severe fatigue, and exposed Sudan to decline every day, adventurers from within the military commanders have emerged to carry out military coups to correct the Sudanese political situation. Those military officers who neither have a proper vision of Sudan's problems, nor how to solve them, made three military coups. The first time was the coup of Ibrahim Abboud in 1958. The second time was the coup of Jaafar Nimeiri in 1969. The third time was Swar el Dahab bracelet to power after the April 1985 uprising. The fourth was the coup of Omar al-Bashir in 1989. It is clear from this narrative that military coups were occurring in every decade. However, once we refer to those periods in which the military coups were carried out and analyze the political situation at the time, it is clear to us all of what I have mentioned through the episodes of the sequence, although each episode has a different title. 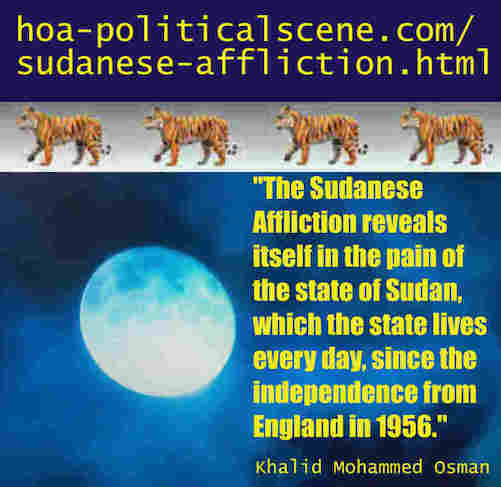 hoa-politicalscene.com/sudanese-affliction.html: Sudanese Affliction: وطأة سياسية سودانية. Revolutionary Ideas. نمو الأفكار الثورية، الثورة السودانية. Sudanese uprising, February 2019. More importantly, it is clear to us that the ruling sectarian party in power was preparing the army to overthrow it and take over the political power. This happened at the invitation of the Umma Party for the first coup in Sudan's history. This has happened again when the Umma Party in power during the third so called democracy in Sudan facilitated the way for Omar al-Basher to overthrow its government, which was led by al Sadiq al Mahadi. The coup of Omar al Basher was carried out by the National Islamic Front (NIF), which was led by Hassan al-Turabi, the brother-in-law of the Prime Minister. When the other rival sectarian party achieved a prior agreement with John Garang, the leader of the Sudanese Liberation Movement (SPLM) in Addis Ababa and came back to Khartoum, as a hero of peace, that had upset Sadiq al Mahadi, the PM and his party. So, the victory of the other sectarian party was also one of the reasons of the coup. It was a chance to invite the Muslim Brothers to make the coup, as long as their leader is his brother-in-law. But, that brother-in-law has fucked everything, after that. He actually, fucked all of the Sudan for revenge of something and died. This reveals to us that personal interests and family interests are what have been playing important aspects of Sudan's policies. As for the people, the best expression we get from these sectarian parties is "go to hell", in the wording of these sectarian parties, which we discover through their political practices. Thus, they have committed a great crime against the Sudan and against the Sudanese people. THEREFORE, ALL OF THE PARTIES OF THE SECTS AND RELIGIOUS PARTIES SHOULD BE BANNED AND THE INSTITUTION SHOULDN'T ALLOW FORING PARTIES ON RELIGIOUS AND SECTARIAN BACKGROUNDS. I WROTE BEFORE ANYONE THINKS OF IT THE COPY OF THE INSTITUTION THAT HAVE BEEN DISTRIBUTED ONLINE WITHOUT REFERRING TO THE AUTHOR, AND I SAID BEFORE MANY YEARS THAT NO REVOLUTION SHOULD BREAKE OUT BEFORE PREPARING THE GROUNDS TO TAKE THE POLITICAL POEWER, SO AS NOT TO BE HUNTED AGAIN BY RELIGIOUS AND SECTARIAN PARTIES. COPIES OF THAT CONSTITUTION ARE ON PAGES ON THE HOA NETWORK. All that I explained while analyzing the Sudanese Affliction in turn reveals to us that there is something similar to the social contract between the sectarian party in power, the Umma Party and the religious officers in the military, before the day they invited the NIF to take over their government. The Sudanese Affliction is a Result of Social Contract Between Religious and Sectarian Parties! When the contract of marriage has done to have Hassan al Turabi, the leader of the Muslim Brothers, as a husband to one of the first ladies of the Umma Party, the contract of marriage has become social contract between the two right wing parties. Even the theory of social contract, which is primarily concerning politics and legitimation of power in the organizational framework to organize the relation between the public and legitimate authorities, has been changed in Sudan to family interests. We should apologize to the philosophers of the French revolution and at top of them Jean-Jacques Rousseau who invented the social contract and made it clear that the inherited legitimation of religion to ruling should fall, and a social contract should be done to define the relations between the ingredients of the society. Any mind that thinks can see that, especially between the Umma Party and the Muslim Brotherhood, led by Hassan al-Turabi, who becomes a brother-in-law to Sadiq al-Mahdi, the leader of the Umma Party and the prime minister of the government in Sudan. Therefore, it is not surprising for us to see that all of the synonyms of "affliction", such as all of that we see in the Sudanese political adversity, the Sudanese political agitation, the Sudanese political ailment, the Sudanese political calamity, the Sudanese political disorder, the Sudanese political distress, the Sudanese political evil, the Sudanese political hardship, the Sudanese political malady, the Sudanese political pain, the Sudanese political scourge, the Sudanese political sorrow, the Sudanese political suffering and the Sudanese political woe occur in the Sudan's political scene. What has actually happened in the Sudan's political landscape is more than that. One of the manifestations of the Sudanese calamity, or the Sudanese pain, is that the social contract between the Sudanese wing of the Muslim Brotherhood and the Sudanese sectarian parties is institutionalized on the basis of religion and the use of religion in politics. These sectarian parties have all been formed on the basis of religion, and religious faith plays the primary and motivating role of these sectarian parties. Thus, the social contract between them and the Muslim Brotherhood was easy to absorb. A Sudanese citizen with a mind can never deny that. But this social contract between the Sudanese sectarian parties and the Muslim Brotherhood is not only based on the use of religion in politics, but also on the factor involved in plundering the wealth of the Sudan and its use to the interests of these parties. They did that, by controlling the channels of the Sudanese national economy to destroy it and create a parallel economy instead of the national economy through Islamic banks and financial companies belonging to these religious parties. These narrow-minded economic interests are shared with similar economies in neighboring Sudan and the Middle East, with similar religious faith. Thus, the Muslim Brotherhood organization in Sudan succeeded in cracking down on Sudan's national economy, building parallel economies and subordinating those economies to the so-called jihadists abroad. As such, the Sudanese political calamity, the Sudanese political upheaval, the Sudanese political sedition, or the Sudanese political crisis have contributed to the exhaustion of the Sudanese people in all of the political periods since the independence of the Sudan from England. All of this reveals that Sudan has lacked the secular National Party, to believe that the state as a political term is a secular state. Such secular party that says Sudan must remain so secular, and at the same time enlightens the masses, as a secular national party that does not celebrate the use of religion in politics. Sudanese lack a secular party that never negotiate with sectarian parties and fights by all means to achieve the existence of the secular state. The only Sudanese party worthy of realizing this dream in the modern secular state is the Sudanese Communist Party. But this party was fought by all the sectarian and religious parties, and accused of atheism, to neutralize the masses of the Sudanese people to join it, and to limit this party in the windmills war, to indicate that it is not atheist in a unified Muslim society. Thus, the sectarian parties have occupied the Communist Party with something phobiatic that has been circulating in this cycle to deny social charges for decades. Think Again of the Sudanese Affliction! 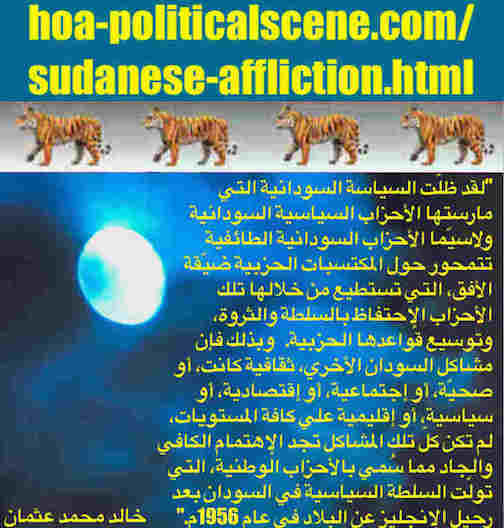 Use the form of the comments on Sudanese Affliction below to Comment on Sudanese Affliction, and write on Sudan Online. You can get your own pages by your name which will appear in the address bar like this: https://www.hoa-politicalscene.com/your-full-name.html, or perhaps a synonym name, if you didn't want to expose yourself on the Sudanese Online platform we have here. Comments you enter on the form titled Comment C2 Entries on SUDANESE AFFLICTION appear on the section of the page belwo the comments form and above this paragraph.